Just think of all the times in your life you've had to pay for tentacles. You buy a car, you've got to pay the extra tentacle fee. You eat dinner at a nice restaurant, they put tentacles on the bill without even asking you. You're driving to work and you remember you left all your tentacles at home, and you've got to stop at a gas station to pick some up on the fly. The list goes on. That's why we know you'll be thrilled to hear that at Gen Con, when you demo a game at our booth, or buy one of our games at the convention, you'll get a tentacle – completely free! That's right. No hidden tentacle fees, no tentacle tips. Free. 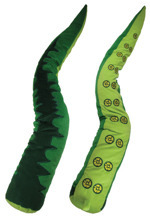 Specifically, you'll get our Plush Tentacle in green. This tentacle giveaway is inspired by Moop's Monster Mashup, a new Munchkin game that we will be demoing and showing off at Gen Con. In this insane, wordplay-packed adventure, players take on the monstrously mixed-up animal creations of the magician Moop using equally wacky animal-themed weaponry. Now back on the subject that's really important here: that tentacle. It's 30" long, and soft and furry. And it's fully posable – no matter what shape you need a tentacle to be in at any given moment, this tentacle can fill that role. Stop by booth 1401 at Gen Con to get yours. Next time you need a tentacle, you'll regret it if you don't. Keep an eye out for even more fun giveaways during the convention!